Previous post: KoKoLoReS: We love Roleplay – December! Next post: KoKoLoReS: GEN-Neutral December! The December round of Hair-O-logy opened today, and I have two new sassy hairstyles for you! Both December and Trish are unrigged mesh and resizable via script. They come in colour hud options 01, 02 and 03. Also out now are four of my hairbases for Catwa heads! They were released last sunday and I totally forgot to make a post about it. 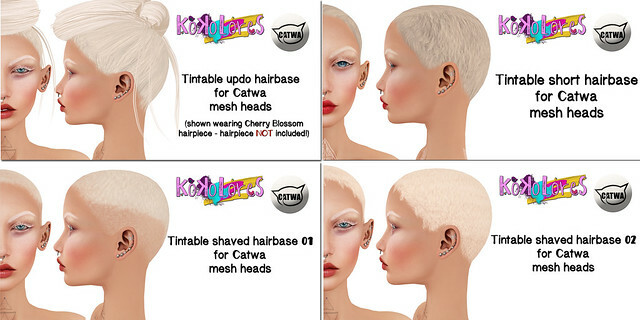 They are Catwa mesh head compatible only and can be tinted via the Catwa hair/teeth/neckfix hud. You’ll find them at the mainstore and also at Hair-O-logy!